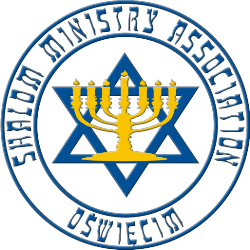 Shalom Ministry has organized international conferences in the month of August for many years now. The conferences relate to the themes concerning Israel and its nation to encourage love and gratitude for our older brothers, the Jews for all that we have received from their Messiah. We believe a good meeting place for all of us to come is our annual conference for which we heartily invite all of you who can come. We do hope that many of you will be able to set aside the time, the funds and a part of yourselves to gather for 4 days here in Oswiecim at the appointed time and place. 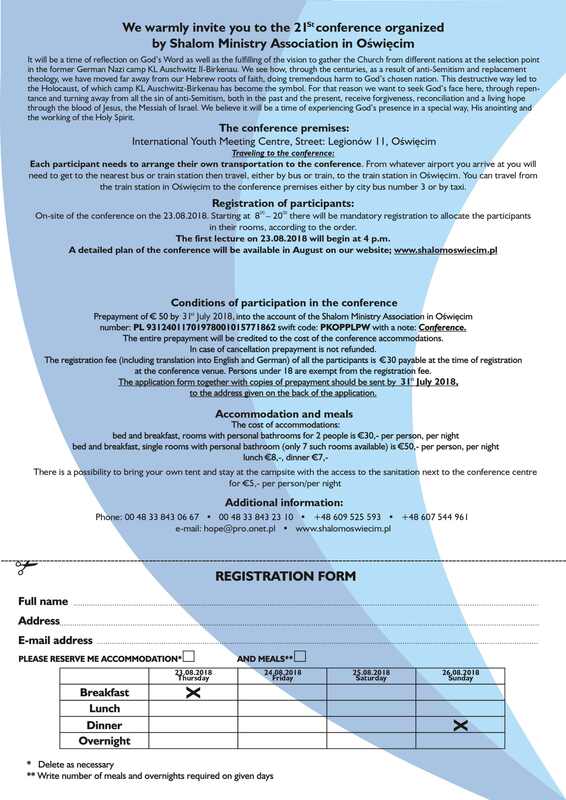 The conference is a very special opportunity, the time when each participant can feel and experience something heavenly that will touch his or her heart. 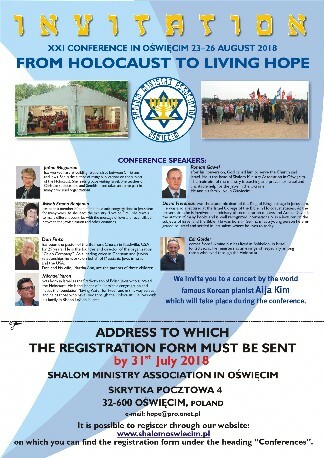 It is our desire that each heart that loves Israel and its nation would participate in this year’s conference in Oświęcim. It will take place between 23 - 26 August 2018, and we feel privileged to invite you. We provide simultaneous translation via headphones into English and German for the time of the conference. We invite all those who haven’t yet been to our conferences to view the photo gallery, as well as the ones who participated in any of them to remember the time spent together in Oswiecim. To take part in our conference simply fill in an online application form and make prepayments to our account.